Preheat the oven to 425º F. Line a baking tray with non-stick baking paper. Place the tomatoes in an even layer on the prepared tray. Drizzle with olive oil and season generously with salt and pepper; toss to combine. Roast for 15-20 minutes, until the tomatoes are just beginning to wrinkle and char. Remove from the oven and let cool to room temperature. 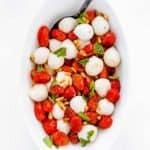 Transfer tomatoes along with any juices to a large bowl. Add mozzarella, pine nuts (if using), and basil. Gently toss to combine. Sprinkle lightly with salt and pepper and drizzle lightly with olive oil. To toast the pine nuts just put them in a heavy skillet over medium heat, stirring occasionally. Heat them until they are lightly toasted and aromatic, about 3-4 minutes.